For those who may not know what a ‘stag do’ is, it is a tradition in Britain for a man who is about to be married to get together with his friends (usually, but not always, male) and have a party. The ‘hen do’ is the woman’s equivalent. They are often marked by a lot of drinking! 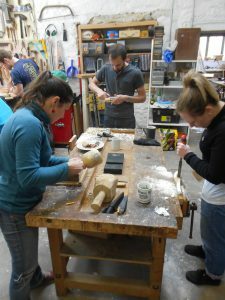 As a twist on the usual festivities, one group came to my studio to learn to how to carve. 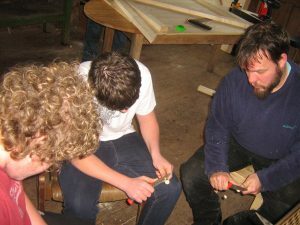 Two people learned how to use axes, knives, drawknives and other green woodworking tools to make spoons. 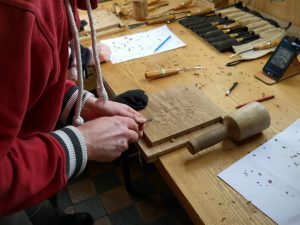 The others learned how to carve relief carvings in oak using a variety of traditional tools. I thought that it was a really nice idea, getting together to learn new skills with friends at this time. Everyone seemed very happy with the work that they produced too. If this idea appeals to you, feel free to get in touch. 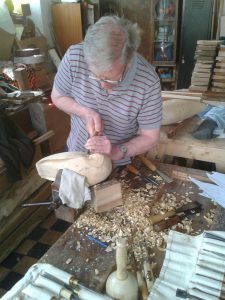 I’m a qualified teacher in the Lifelong Learning sector and have taught woodcarving and woodworking skills to adult groups in all kinds of situations. 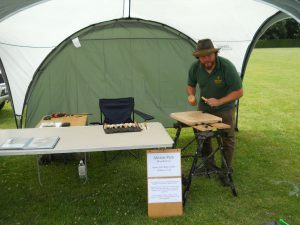 Over more than ten years, these have included; festival goers (including at Glastonbury and the Green Gathering), corporate groups, the NHS, private tuition sessions and also working in partnership with community organisations. 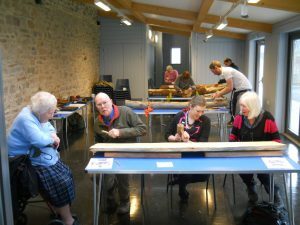 Venues have ranged from muddy fields to my own studio in Bristol with the participants ranging in age from 18 to over 80 years old ( I can’t be more specific as it seemed rude to ask!). 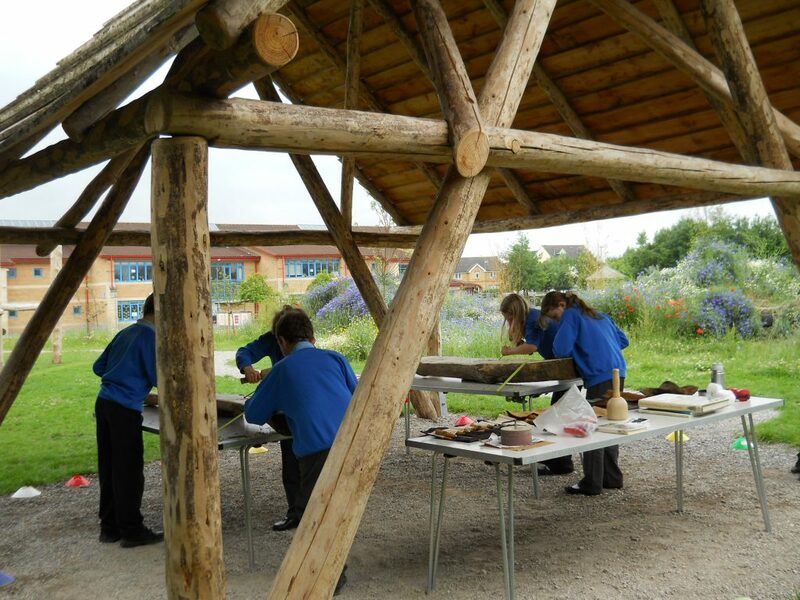 This project was run in collaboration with the Wild City Project and LinkAge in Bristol. 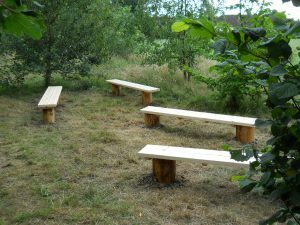 A group of local people, including disengaged young people and older volunteers, worked together successfully to produce a carved wooden bench that was installed in a local nature reserve. Several groups that I’ve worked with have included a range of ages. 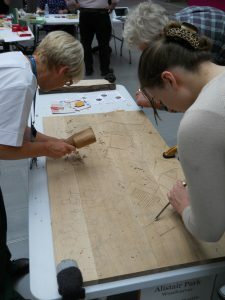 In workshops for Bristol City Council’s ‘Learning Communities‘ project in the St Annes Park area of Bristol, participants were encouraged to bring their children along and together they carved noticeboards. 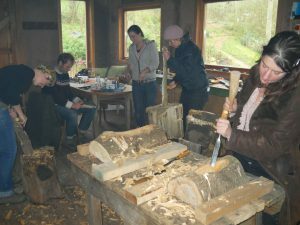 If you are interested in learning woodcarving, green woodworking or other woodworking skills with a group of adults or with participants who are a range of ages, then get in contact with me. 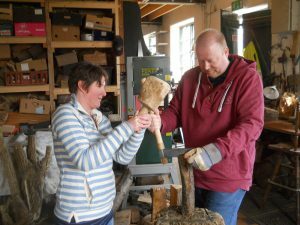 I’ve previously worked with both young people and adults with learning difficulties. 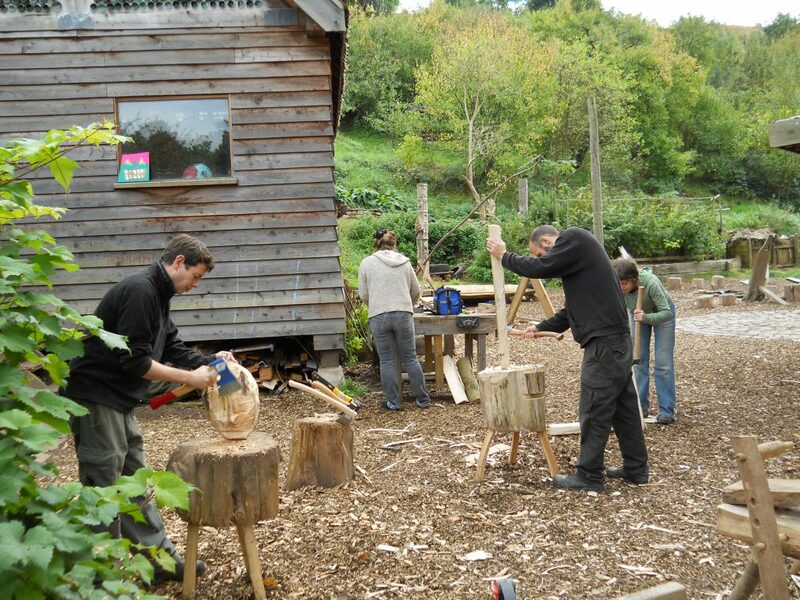 I worked with adult learners through an organisation called ‘Treedom’ (teaching woodworking skills) and for Bristol City Council teaching their Foundation arts and crafts course. I really enjoyed both jobs and meeting the people that I worked with, some of whom were great characters and a lot of fun to spend time with! 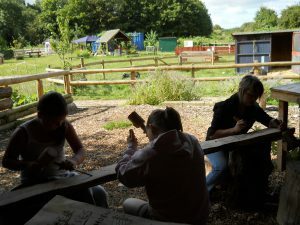 I have also worked with several groups of young people with learning difficulties at St Werburghs City Farm in Bristol and found it not only a lot of fun, but also very rewarding. Getting them to work together to achieve some really good results was great to see. 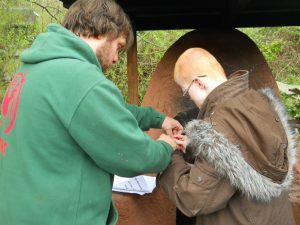 If you have a project in mind involving working with people who have learning difficulties, I’d love to hear from you. I also hold an enhanced DBS check. 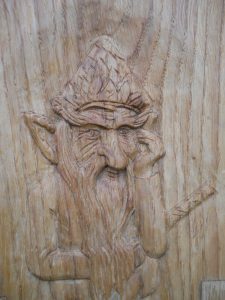 It’s always interesting to see what different students want from tutored woodcarving sessions and adapting my teaching to them. 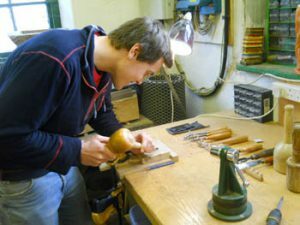 Some people like to be shown a few particular techniques and then to get on with practising them with some guidance if needed, whereas others want to try as many different things as possible in the day. Both are fun be a part of, of course. My session of tuition with Katya was definitely the latter and it was the first taught session in my lovely new workshop. I really enjoyed using some tools again that I don’t use that frequently and discussing how to use them too. 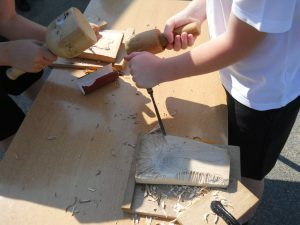 One great thing about teaching one-to-one is that learners can use some of the power tools that I’d sometimes be wary of bringing out with a group. When things go wrong with power tools they can go wrong very quickly, so I like to be able to keep a close eye on things. 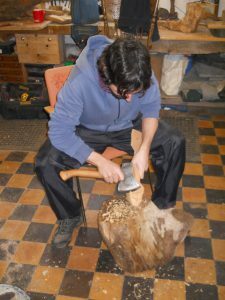 I wouldn’t usually teach people to use certain tools such as chainsaws or Arbortechs in carving as they are potentially so dangerous to inexperienced users (or experienced ones!). 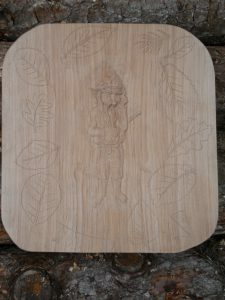 Tools such as the scroll saw are a lot less aggressive and so I’m happy to use that occasionally. 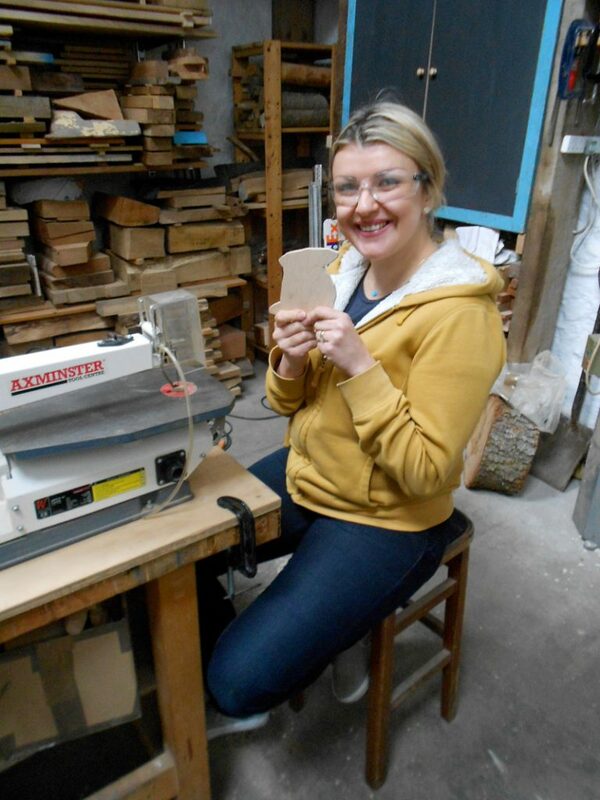 Katya wanted to make some wooden frames for embroidered pieces that she had produced. First of all, I showed her how to use a panel saw (below) and a coping saw (first photo) properly. 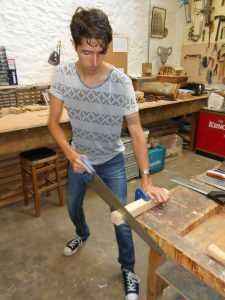 Cutting accurately by hand with a saw is a skill that anyone using wood should know. Electric saws are great, but occasionally only a hand saw can be used (when there’s no electricity available, for example). 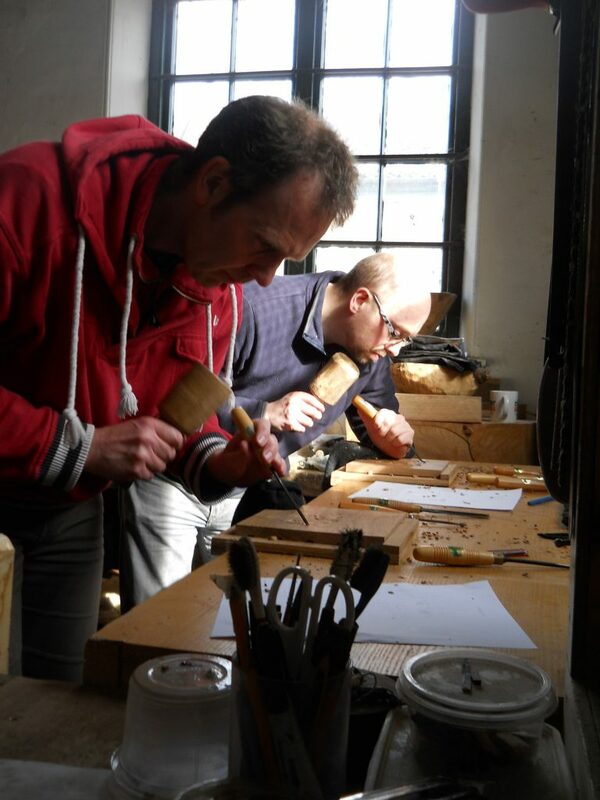 We also tried using a Dremel hand drill, an electric powered wood lathe and an electric drill. 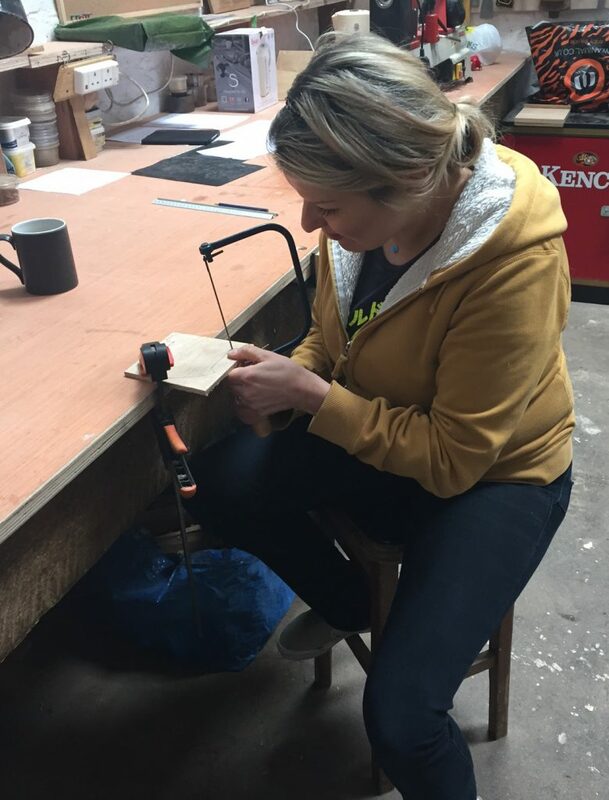 It was the first time that Katya had used any of them but I think that by the end of the session, the scroll saw was still the favourite! She also kindly let me use her photos in this blog post. 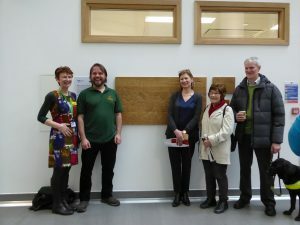 These oak panels, featuring braille as part of their design, are part of a permanent installation at the Brunel building in Southmead hospital – a major healthcare facility in Bristol. Initially, the commission was to make an artwork that would include words and phrases chosen by patient’s knitting and writing groups as being important to them. 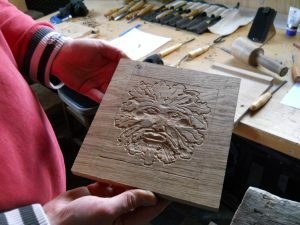 As part of the making process there also had to be an opportunity for patients, visitors and staff to try their hand at carving parts of it during two hospital open days. On visiting Southmead, I realised that most wall-hung artworks there didn’t really give much opportunity for blind or partially-sighted people to interact with them. They were mainly prints behind glass. Working with guidance from local braille users, together with organisations and blind artists from around the country (particularly Alan Michael Rayner), I designed a touch sculpture that also includes braille as a fundamental part. 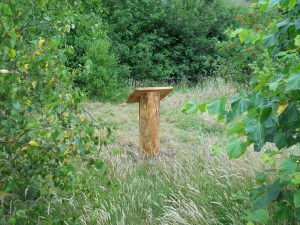 The Bristol Braillists group were particularly helpful with this area of the project. 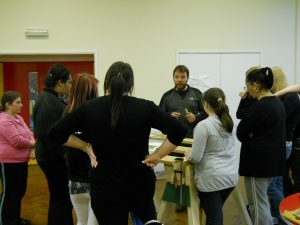 Paul and Hazel from the group even visited my workshop to give help and advice on the design. Eventually, the installation developed into three panels. 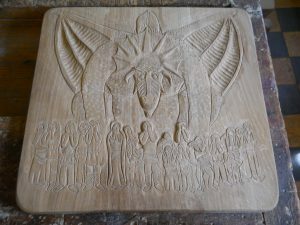 The largest one shows the patient’s groups knitting and writing, together with a carver (who might that be?). 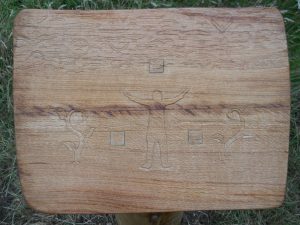 The knitting, writing and carving is spilling off the table to become a landscape with the important words and phrases written on it. 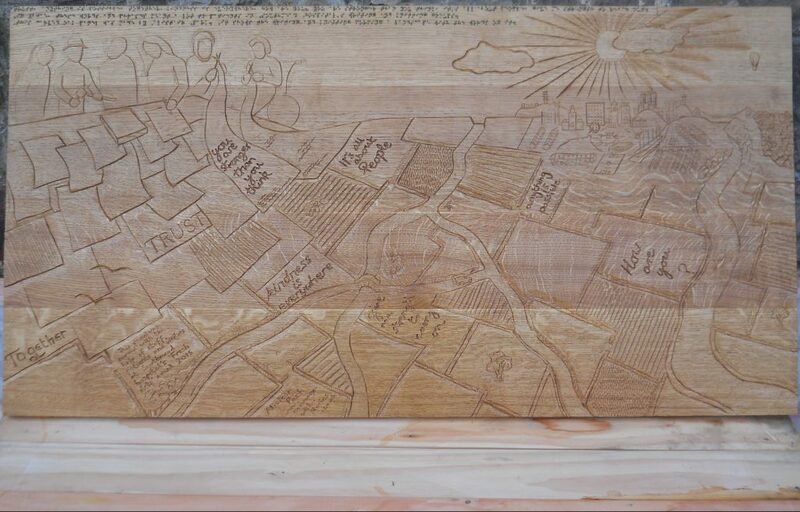 In the top right-hand corner are well-known buildings in Bristol. 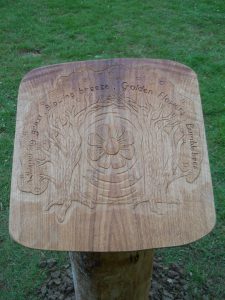 Above it all is a description in braille, made from brass pins that have been fixed into the oak. 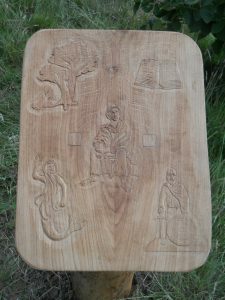 The second panel shows a much smaller version of the main panel (a bit bigger than A4 size), with different features labelled in braille. This was suggested by Camilla at Living Paintings, who pointed out that blind people can get ‘lost’ when feeling their way through a large area. 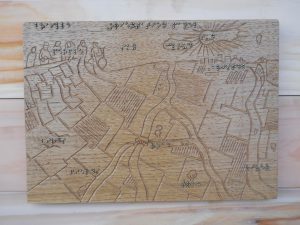 This small orientation panel allows visitors who are using touch to work out where they are going on the larger artwork. 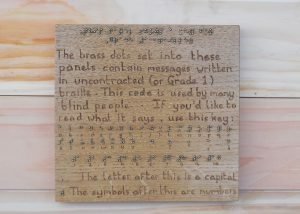 The third panel is a key to Grade one braille, so that sighted visitors who would like to work out what the braille on the other panels says can do so. There are several types of braille, with grade one being the simplest – a letter-by-letter translation. This inspired some discussion about whether it was the best form to use, as most British braillists use Grade two braille which is quicker to type out and to read. However, most users felt that people who weren’t so confident in reading braille and those from other countries would find this form easier to understand. 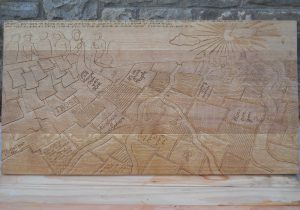 Once the panels had been fitted in March 2016, the installation was unveiled by the Chief Executive of NHS South-west, Andrea Young. She is standing in the centre of the photo below with Ruth, the arts director for Southmead, standing to the left of the picture. It was great to see that Paul and Hazel, who had helped in the design, could make it to the unveiling too. 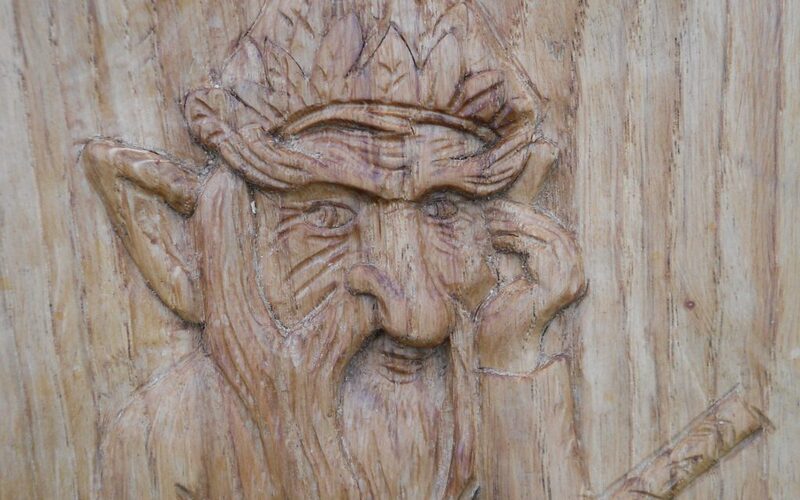 I really appreciated the opportunity to explore new ways of interaction with public carved sculpture but also being given the chance to find out more, as a sighted person, about how blind and partially sighted people interact with the world around them. I hope that the things learnt can be incorporated into future projects and thank you to everyone who generously gave their time to help me with practical advice and suggestions.